Caïman - Dictionnaire Visuel - Copyright © 2005-2016 - Tous droits réservés. 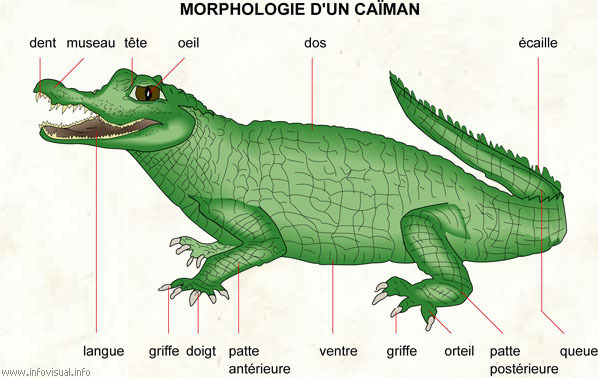 [img]https://infovisual.info//storage/app/media/02/img_fr/022-morphologie-caiman.jpg[/img] [url=https://infovisual.info/fr][/url] - [url=http://www.infovisual.info/]Dictionnaire Visuel[/url] - Copyright © 2005-2016 - Tous droits réservés. Morphologie d'un caïman: reptile crocodilien pourvu d'un museau large et court, vivant en Amérique. Dent: organe dur du caïman servant au déchiquetage des aliments. Museau: partie de la face du caïman située au-dessus de la bouche. Tête: première partie du caïman qui est rattachée au tronc. Oeil: organe de la vision du caïman. Dos: partie supérieure du tronc du caïman. Écaille: chacune des plaques osseuses recouvrant le corps du caïman. Queue: prolongement de la colonne vertébrale du caïman. Patte postérieure: membre arrière du caïman. Ventre: partie inférieure du tronc. Patte antérieure: membre avant du caïman. Doigt: appendice articulé de la patte antérieure du caïman. Langue: organe gustatif du caïman. Alligators and caimans are archosaurs, species of crocodilians and form the family Alligatoridae, sometimes regarded instead as the subfamily Alligatorinae. Alligators differ from crocodiles principally in having wider and shorter heads, with more obtuse snouts; in having the fourth, enlarged tooth of the under jaw received, not into an external notch, but into a pit formed for it within the upper one; in lacking a jagged fringe which appears on the hind legs and feet of the crocodile; in having the toes of the hind feet webbed not more than half way to the tips; and an intolerance to salinity, alligators strongly preferring fresh water, while crocodiles can tolerate salt water due to specialized glands for filtering out salt. In general, crocodile tend to be more dangerous to humans than alligators. Alligators proper occur in the fluvial deposits of the age of the Upper Chalk in Europe, where they did not die out until the Pliocene age. The true alligators are now restricted to two species, A. mississippiensis in the Southeastern United States, which can grow to 4.24 m (14 ft) and weigh 454.5 kg (1000 lbs), with the record length of 5.79 m (19 ft), and the small A. sinensis in the Yangtze River, People's Republic of China, which grows to an average of 1.5 m (5 ft). Their name derives from the Spanish el lagarto, which means "the lizard". In Central and South America, alligators are represented by five species of the genus Caiman, which differs from the alligator by the absence of a bony septum between the nostrils, and the ventral armour is composed of overlapping bony scutes, each of which is formed of two parts united by a suture. Some authorities further divide this genus into three, splitting off the smooth-fronted caimans into a genus Paleosuchus and the Black Caiman into Melanosuchus. Caimans tend to be more agile and crocodile-like in their movements, and have longer, sharper teeth than alligators. C. crocodilus, the Spectacled Caiman, has the widest distribution, from southern Mexico to the northern half of Argentina, and grows to a modest size of about 2.2 meters. The largest is the near-threatened Melanosuchus niger, the Jacare-assu, Large, or Black Caiman of the Amazon. Black Caimans average 3-4.26 meters (10-14 ft) with the largest recorded size 5.79 m (19 ft). The Black Caiman and American Alligator are the only members of the alligator family posing the same danger to humans as the larger species of the crocodile family. Although the Caiman has not been studied in-depth, it has been discovered that their mating cycles are linked to the rainfall cycles and the river levels in order to increase their offspring's chances of survival.